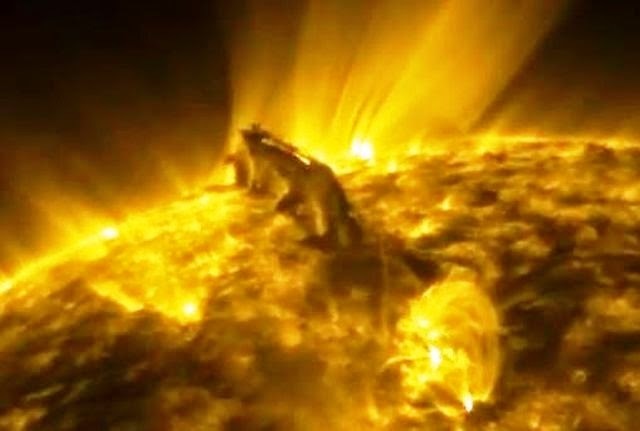 Most solar flares come from sunspots. The next big explosion, however, could come from a different source: On February 5, 2015, a huge filament of magnetism is snaking over the sun's southeastern limb. According to spaceweather, the structure, a tendril of plasma of more than 400,000 km long held suspended above the surface of the sun by magnetic forces. If the filament were peeled off the sun and stretched out, it would easily reach from Earth to the Moon. If the filament becomes unstable and erupts, it could hurl parts of itself into space. Pieces of the filament falling back to the solar surface would explode upon impact, creating one or more Hyder flares. Astronomers with backyard solar telescopes are encouraged to monitor the structure as it turns toward Earth. A photogenic explosion may be in the offing. UFOvni2012 made an amazing clip of this event.